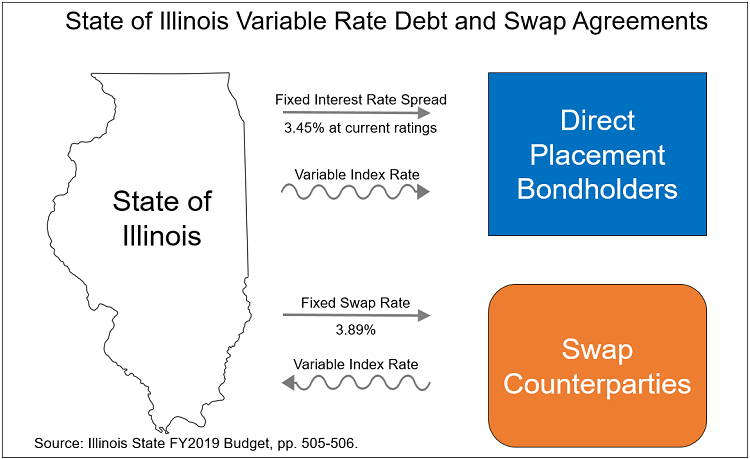 Illinois will issue bonds next week to refund all of its outstanding variable rate debt, pay the cost to terminate its interest rate swap agreements, and refund some outstanding fixed-rated debt for budgetary savings. The State has only one outstanding series of variable rate debt, Series 2003B, totaling $600 million of principal. After this transaction, all of the more than $30 billion of outstanding Illinois General Obligation bonds will be fixed rate. The move follows other issuers in the State, such as the City of Chicago and Chicago Public Schools, who have refunded most of their variable rate debt and exited most swap contracts since 2015. However, while those issuers were forced to terminate swaps due to crumbling ratings, the State has managed to wait until it could end its swaps at a much lower cost. Under the State’s current variable-rate bonds, the State pays bondholders an interest rate that floats according to a market index known as the London Inter-bank Offered Rate (LIBOR), plus a spread according to the State’s credit ratings. The current spread is 3.45%, but prior to the multiple downgrades in 2017 the spread stood at 2.95%. Traditionally, the owners of some types of variable-rate municipal bonds can demand repayment at any time. Prior to 2016 the State had agreements with various banks to remarket the bonds and agree to purchase the bonds in case they could not be remarketed. As the State’s credit rating fell, this arrangement became more risky. Accordingly, in 2016 the State negotiated direct placement agreements with four banks that agreed to purchase and hold the bonds until November 7, 2018. By refunding the bonds with fixed-rate debt, the State avoids the need to renegotiate these contracts or find new bondholders. When Illinois issued the 2003B series, it also entered into swap agreements with banks that “synthetically fixed” the variable rate debt. The swap counterparties would pay the State a variable rate that would mostly cancel out the rate on the bonds, while the State would pay the counterparties a fixed rate. Currently that rate is 3.89%. Combined with the private placement agreements, this makes for a current effective interest cost of 7.34%, plus the floating index rate for the variable rate bonds, minus the floating index rate paid by the swap counterparties. The following diagram shows the various payments associated with the variable rate debt and swap agreements. Swap contracts typically have clauses stating that both parties have to maintain certain credit ratings. As Illinois’ General Obligation ratings experienced multiple downgrades during the State’s two-year budget standoff, it came close to going below the thresholds in the swap contracts. This would have required the State to immediately pay the counterparties the fair market value of all remaining payments under the contracts. Since prevailing interest rates have been low for most of this decade, this would have mean payments of more than $100 million. To avoid termination, State twice renegotiated its swap contracts in 2016 and 2017. The following table summarizes the results of those negotiations. Fortunately, the adoption of full-year budgets for Fiscal Years 2018 and 2019 has caused the ratings agencies to refrain from downgrading the State further, and Moody’s has even changed its outlook for Illinois from negative to stable. Additionally, as prevailing interest rates have risen, the cost to end the swap agreements has dropped from over $150 million in 2016 to $74 million as of August 1, 2018. The enacted FY2019 budget authorized the Governor’s Office to issue debt to refund the variable rate debt and pay the termination costs of the swaps. The Governor’s office will sell the bonds next week, and believes that it can refund the $600 million of variable rate debt as well as terminate the swaps for $657 million of principal. Additionally, the State will issue about $264 million to refund outstanding fixed-rate debt for interest rate savings. The state is expected to pay lower interest rates on the new bonds than it did on $500 million of capital bonds that it issued in May.